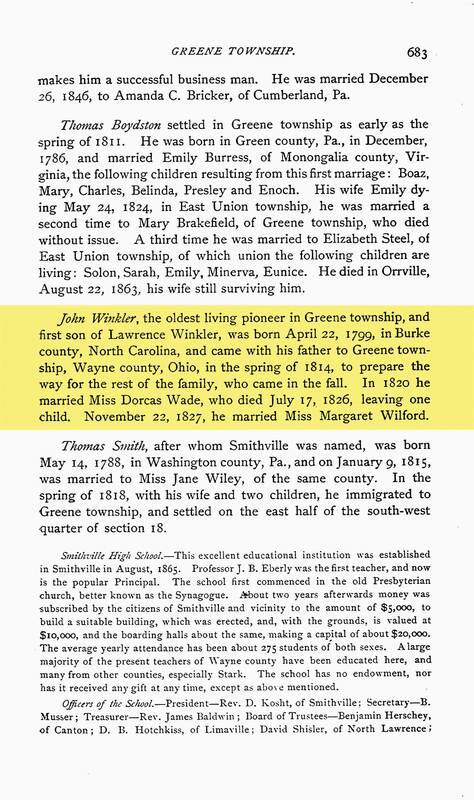 Winkler Bible Vital RecordsFrances Paine was born to George & Elizabeth "Lizzie" Paine of Spotsylvania County, Virginia on 18 Nov 1775 (exact location unknown). Fanny had two brothers that we know of: John, born in 1772 and William, born in 1774. 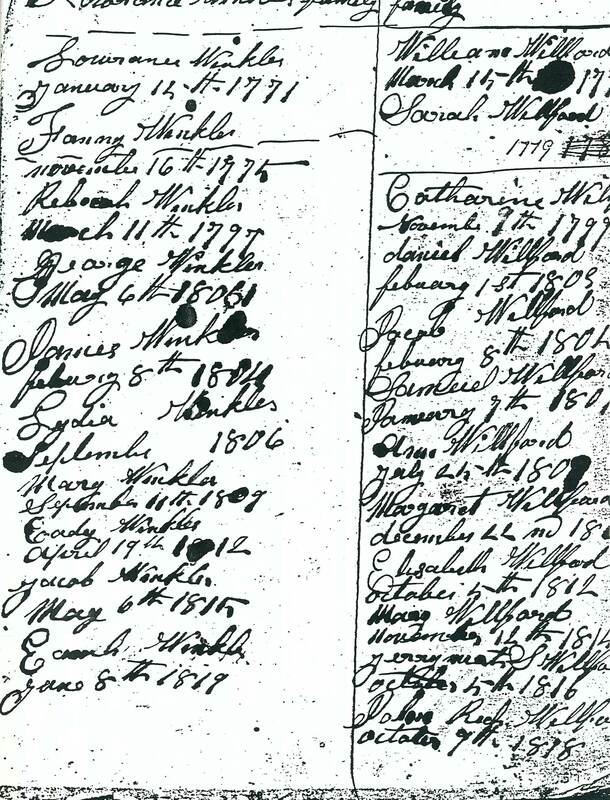 The family supposedly left Virginia in December of 1783 and moved south to Burke County, North Carolina where father, George, can be found on the 1790 census. 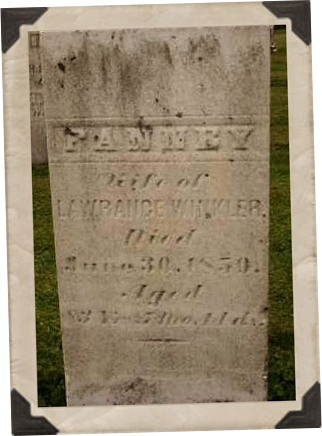 Lawrence Winkler married Frances "Fanney" Paine in 1795. A long-held belief is that Fanney was from New Jersey and this is also where the marriage is said to have taken place. Not only is there a lack of proof to support this, but evidence leads us to believe that they married in Burke County, North Carolina instead. Backing this up is Fanney's known relocation from Spotsylvania County, VA... there is no mention of New Jersey in the Paine family. 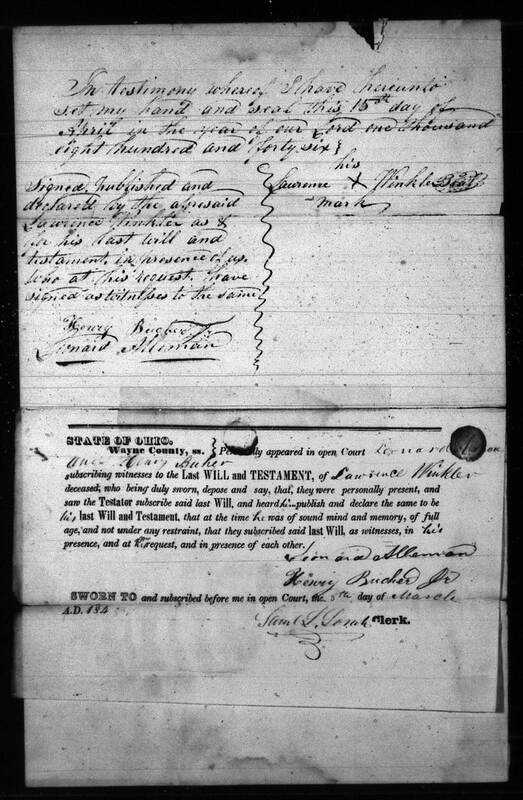 In 1806, being opposed to slavery, Lawrence decided to leave Burke, North Carolina and seek a home in one of the free states, with the intention of settling in Stubenville, OH with relatives (3 years after Ohio receives statehood). However, the family had to halt relocation in the middle of what is now Monongalia County, West Virginia, because of sickness (it was still a part of Virginia at the time). 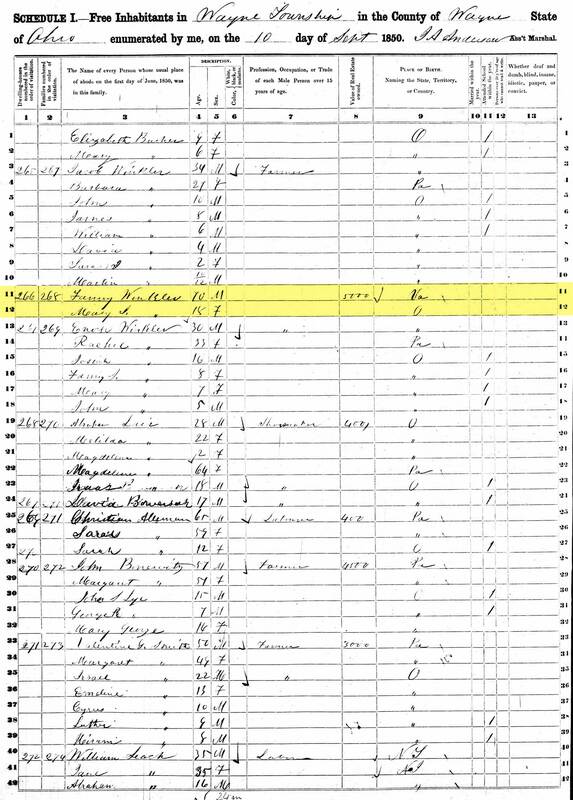 1850 Census for FannyOver the next seven and a half years the family lived in Monongalia County2, 3 where Lawrence and Fanney would welcome 3 more girls to the family. 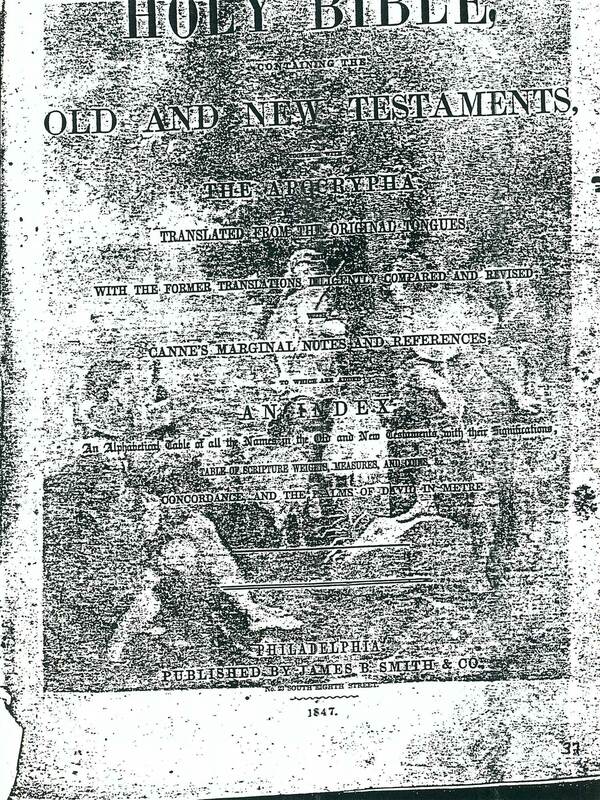 It wouldn’t be until Feb 1814 when Lawrence finally would decide to continue his journey northward to Stubenville. Lawrence set out with his eldest son John. They took one horse on which to carry provisions and occasionally ride. They also drove one cow and calf. They crossed the Ohio River at Steubenville, where some of his relatives lived, and where he had expected to locate. Not being pleased with the country there, he obtained considerable information about the country farther north, and decided to travel on to Northern Ohio. Lawrence’s Brother-in-law Jacob Brakefield [Brackbiel] had preceded him and settled in what is now Wayne County. The country was almost an unbroken wilderness covered in lush forest. 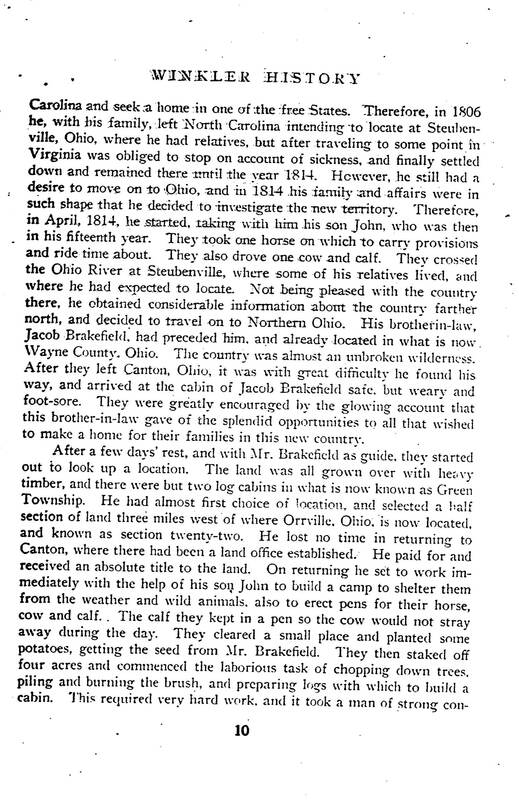 After they left Canton, Ohio, it was with great difficulty he found his way and arrived at the cabin of Jacob Brakefield safe, but weary and sore. 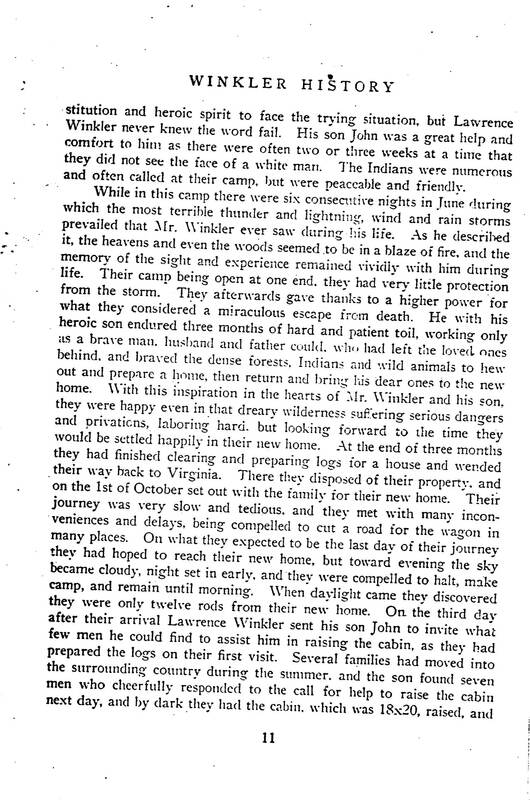 Lawrence Winkler Will (1848)On returning, Lawrence and son John immediately started to set up camp and shelter from weather and wild animals. They proceeded to erect pens for their horse, cow and calf. They cleared a small area of land and planted potatoes. Then, they staked off four acres and began chopping trees, clearing brush and preparing logs to build a cabin. Word is that Indians were many in the area but were peaceful and friendly and often stopped by their camp. It took Lawrence and his son 3 months to clear the area and prepare all the logs needed for a house. When finished, they packed up and headed back to Virginia. 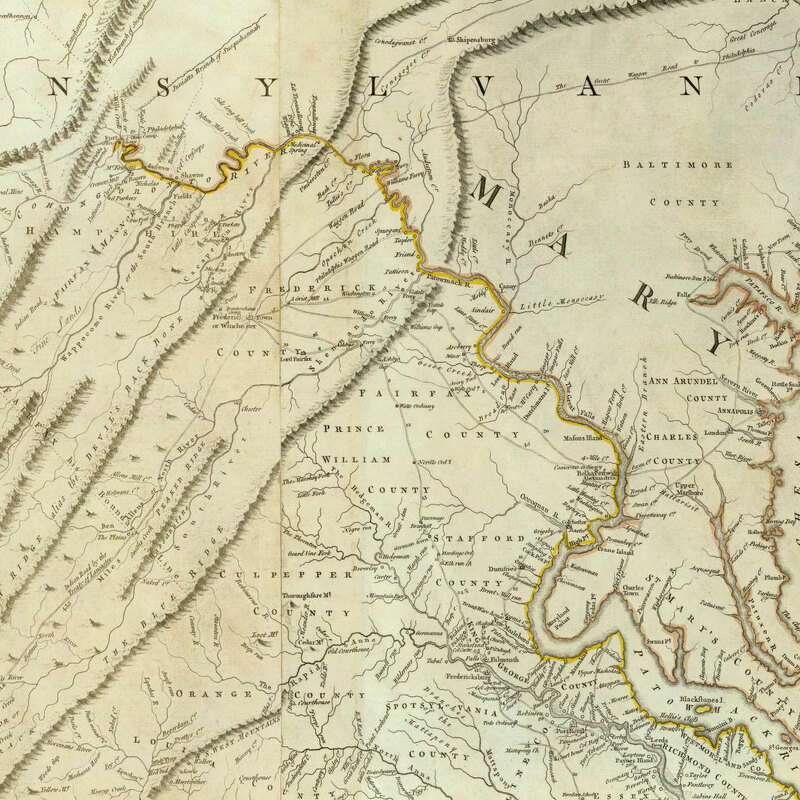 On 01 Oct 1814, Lawrence left Monongalia County, Virginia (now WV) with the entire family to return East Union (later Green Township). NOTE: It should be mentioned that at this time America was in the middle of the War of 1812 with Britain and the Indians. The Treaty of Ghent was signed Christmas Eve 1814 and ratified in Washington 17 Feb 1815. Months prior, in August of 1814, Washington DC was practically burned to the ground. The road was rough and they are said to have experienced many delays, most of them requiring Lawrence and Jacob to cut a path wide enough for their wagon to travel. 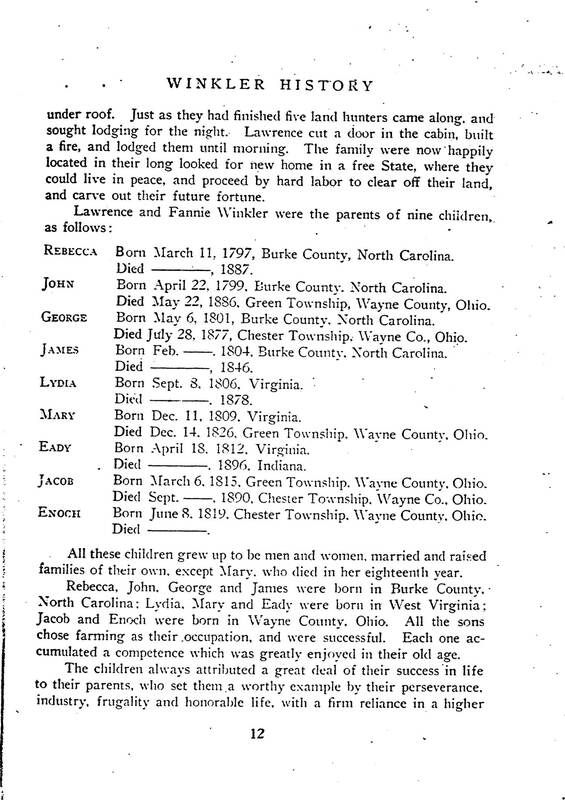 History of Wayne County (1878)Three days after their arrival, Lawrence sent John out to gather all the men he could find around their rural wilderness homestead to assist in raising the cabin with the logs they had previously prepared. Several families had moved into the area that summer and John returned with seven men who were more than happy to respond to the call. By nightfall the Winklers had an 18x20 ft. cabin and a roof. Lawrence cut a door, built a fire and the family had a place they could call home. Note: Many early facts that W.S. Myers noted about The Winklers seem to be questionable at best. He mentioned that Fanney was from NJ and they were married there. No proof has been found of this. Lawrence & Fanney were both living in Burke, NC at the time based on 1790 and 1800 census records1 and all evidence says Fanny was from Virginia. However, the majority of the information he relays about the couple after their marriage matches up with recovered documents. 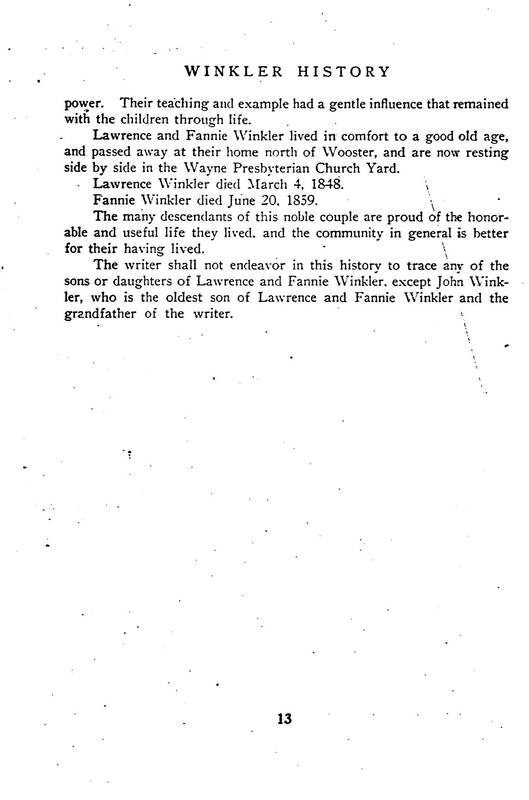 As often as old family stories go, it is more likely the stories got crossed over time and became attributed to Lawrence and Fanney instead of their ancestors. 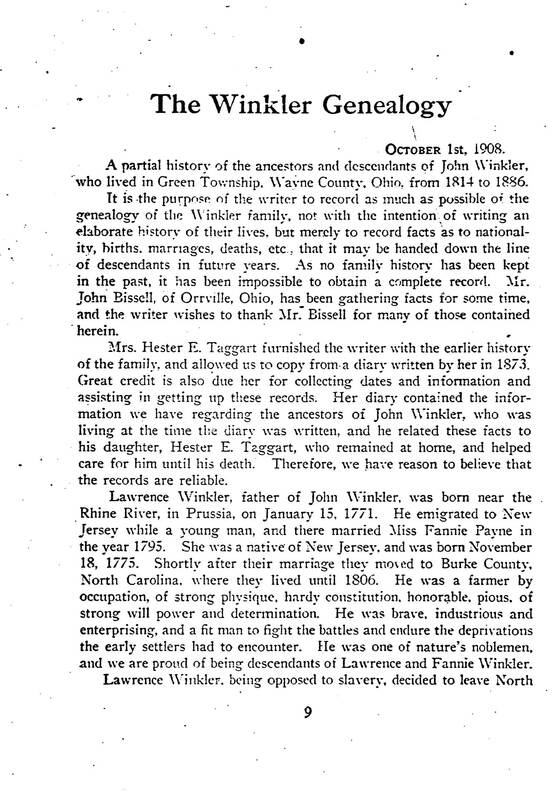 My personal belief is that the New Jersey marriage is probably for Lawrence's parents (it has been fairly well documented that Lydia Colver married a Winkler in New Jersey) and either his father or grandfather was born along the Rhine river in Prussia. 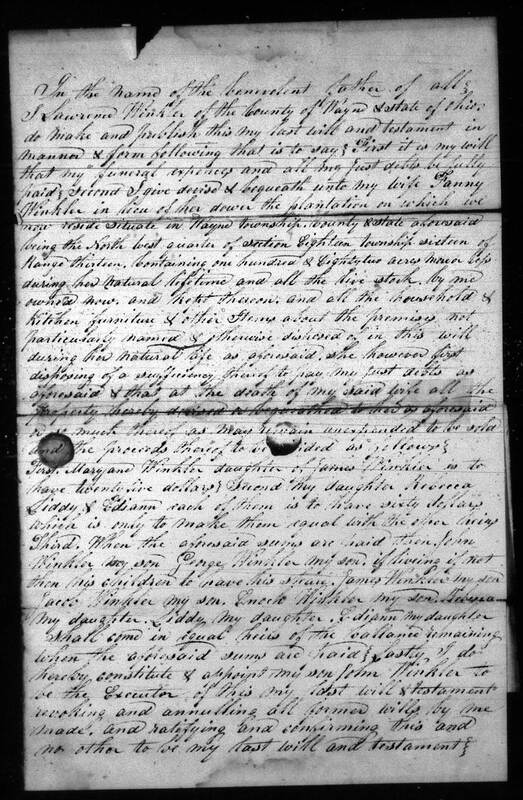 B By 1790 Lawrence's father Hans "Jacob Winkler" and Frances' father George "Pane" are living just a few farms down the census record from each other on the same page of the 1790 U.S. Federal Census (column 3 Jacob is about 20 lines below George... about 7 lines below Jacob is "Barnett Pain", Frances' Uncle). This is all in "8th Company", all of the other Winkler relatives live in what appears to be the next township over, listed as "7th Company", comprising of Big & Little Conrad, Thomas, David, and Adam.